Around 1860, Joseph J. Ramseyer built Wooster's first brewery for the production of both ale and lager beer. It was known at that time as the Apple Creek Brewery, standing just a half-mile from the creek. The brewery's actual location was at the intersection of Dalton Road, Apple Creek Road, and Pittsburg Avenue, just outside of the city limits in an area known as Soaptown. Today, the site is between East Lincoln Way (U. S. Route 30) and Sylvan Rd. The brewery started as a small enterprise in the 1860s, producing several hundred barrels per year, but was enlarged in the mid-1870s to a size which it would retain for the next 40 years, producing between 2,000 and 2,500 barrels per year. It had a simple three-story wooden frame brewhouse, with an attached icehouse and beer cellar. A large pond was behind the plant and was used for cutting ice in winter. Another smaller icehouse was beyond the pond. In later years, however, mechanical refrigeration was introduced, and the plant produced large quantities of ice. A bottling house was added in the early 1890s as well. While the creek provided the brewery's original water supply, a large well was dug on the property in 1904, providing a much purer source of water at a rate sufficient to supply the growing plant's needs. Local records indicate that the property changed ownership numerous times during the 1860s and 1870s, but Ramseyer appears to have operated the plant until 1870, when it was sold to Martin L. Rich (a recent immigrant from Alsace, whose brother Peter operated a brewery in nearby Amwell) and Jacob Roth. The latter sold his interest in 1874 to Jacob Mougey (also spelled Mongey), the son of French immigrants. Rich soon found himself under pressure from his Mennonite church to leave this profession which produced alcoholic beverages. However, since Rich had no other income source, he spent several years attempting to sell his share of the brewery, while investing in his own farm. He would finally sell his brewery interest in 1879 to John Graber, who was Mougey's brother-in-law. Mougey sold his interest in 1882 to George J. Renner, Sr., a prominent German brewer who had recently come north from Cincinnati. Renner and his son, George, Jr., were both involved with the plant for two years. George, Sr. would move on to Mansfield in 1884, operating the Renner & Weber brewery until 1888, when he moved to Akron to operate his own brewery there until his death. George, Jr. would move to Youngstown to establish his own brewery there. Between 1884 and 1888, Graber operated the brewery alone, until selling it to Frederick Weis. The latter operated it until 1890, when he defaulted on his mortgage with Graber (the plant was valued at $15,000 by this time, and Weis still owed $11,000). This was due to an inability to secure an adequate supply of ice during the previous winter, the warmest of the past century, with a subsequent loss of 500 barrels of stored beer. Operations were thus suspended until Graber retook control of the plant late in the year, after which it was renamed as the Wooster Brewing Co. In 1895, Graber again sold the brewery, this time to Robert Weisman of Chicago, and F. Runge, formerly superintendent of a brewery in Monterey, Mexico. As before, the change was brief, as the pair had sold the company back to Graber one year later. Also in 1895, the dam of the brewery's ice pond broke during a late summer storm, flooding the immediate area and damaging several buildings, although they were quickly rebuilt. In late 1903, a stock company was formed by a group that included John Koerber, who was also the principal force behind the founding of The Akron Brewing Co. at the same time. This new company called itself the Wooster Artificial Ice & Brewing Co., and had a capital stock of $50,000. A new group of investors, all local restaurant and saloon owners, became officers of the company, including Henry Howard as president, Isiah Fisher as vice-president, Fred Faber as secretary, and Frank Naftzger as treasurer. Other directors included Henry Schuch, James Schliner, and W. J. Noggle. All of them served "Wooster Lager" in their establishments, where a quart bottle could be had for a nickel. Graber's son, Samuel E. Graber, also remained with the company, and within several years became its new president. In 1908, the Rose "local option" Law was passed, allowing largely rural Wayne County to vote itself dry between 1909 and early 1912. This seriously hurt the company's brewing operations, although the increasing emphasis on ice production would allow the plant to stay functional during this period. In 1913, the Mougey Ice Co. was formed in Wooster, with its main warehouse at 545 Pittsburg Ave., although it appears that this was just a distribution company for ice produced by the brewery. Its founder, Jacob Mougey, had remained loosely tied to the brewery as a family member, although after selling his share of the brewery many years earlier, he had been the county sheriff for a brief time, a saloonkeeper, and more recently a horse trader. The ice company was managed by Andrew M. Smith, a younger family member. 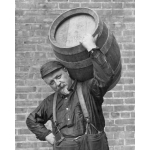 In 1916, brewing operations ceased, and Graber sold his interest to the Mougey Co. (Graber would later become a lumber dealer, and was briefly involved with the Canton Brewing Co. in 1933 and 1934 as its brewmaster). The plant continued to produce ice, however, until 1927, when the Mougey Co. closed. For a brief time before closing, the company was renamed the Mougey Beverage Co., bottling cola in addition to making ice. The company also sold coal during the 1920s. Andrew Smith's son, James, was the company's secretary during this time. The property stayed in the Smith family for many years after that, and it appears that the brewery building stood until the early 1960s, when it was razed for the construction of the U.S. Route 30 bypass. There are no remains of it today.